Our new single, Under The Sun, is out now! Here’s the video, created for us by Graeme O’Hara. You can buy the single on Bandcamp or iTunes. It’s also streamable on Spotify. The album, Cowardly Deeds, is out on May 20th and we’re having a launch gig at St Luke’s in Glasgow on that date. TICKETS ARE NOW AVAILABLE! The support comes from the terrific Glasgow indie band The State Broadcasters and the terrific Glasgow indie band Woodenbox. TICKETS ARE NOW AVAILABLE!!! We’ve had some really fun gigs recently. Thanks very much if you were an audience member or an organiser who helped them happen. I really enjoyed playing in the One Touch Theatre at Eden Court in Inverness, supporting Woodenbox. It was a different kind of venue for us but the sound on stage was amazingly clear and we had a lot of fun (despite my lack of organisational skills nearly ruining the gig twice). Here’s a review. And here’s another review. For any Inverness audience members who were disappointed that they didn’t get to hear the punchline to Pete’s joke, he told it the following night at the Stirling Tolbooth and you definitely weren’t missing out. I can’t say my jokes fared any better though (unless maybe stony silence / mild groaning / suppressed retching are signs of amusement in Stirling?). Good gig though and we were were looked after by the Tolbooth staff. I also had a great time at the Leith Depot on Thursday night, playing solo alongside Haystack Monolith and Gummi Bakko. Thanks to the lovely audience for listening to the songs and chatting to me afterwards and well done to Ian from Glint Recordings for hosting such a nice night. Lastly, there’s a new EP out by The Smart Set which is the work of former Randolph’s Leap keyboardist Gareth. Give it a listen. It’s called Cowardly Deeds, it’s a 10-song album and it’s coming out on May 20th! Keep an eye out for more updates on the launch gig, singles, videos and how to pre-order the album. It feels really good to get the ball rolling on a new release. We had a great time making this one and are really looking forward to sharing it so thanks to everyone who has shown an interest in our music and enabled us to keep making it. If you’d like a preview of what the album sounds like, head over to the Glastonbury 2016 Emerging Talent Playlist. We’re delighted to have been longlisted to play the festival this year and have uploaded a brand new song called Under The Sun. It’ll be the first single from Cowardly Deeds and there’ll be a music video coming soon. It’s been a busy year for us, musically and otherwise. Amid all the gigs and festivals there have been weddings, overseas voyages, house moves and job changes. Iain’s multifarious talents have landed him a job in Birmingham so you may notice a new face behind the drum kit. That face is attached to a body and that body belongs to a person. His name is Adam and he has red hair so I’ve naturally taken a shine to him. Welcome aboard Adam! Lang may yer snare rattle. My big change is that after 7 years of living in Glasgow I’ve moved to a small village in Stirlingshire. It’s quite a change of pace. Glasgow is a mad place and such a strong cultural force so I definitely miss certain aspects. But the countryside provides so many other things that I’ve been looking for in life. I’ve even discovered that the driver of the mobile library is a fan of the band. That’s a key Randolph’s Leap demographic right there. Music-wise, we’ve been getting artwork and a few videos ready for the next album. Just waiting for an ETA from the manufacturers and then we should be able to set a release date for 2016. The sooner the better as far as I’m concerned. It’s an exciting stage, and an odd feeling, drawing a line under everything and putting it in someone else’s hands. It’s amazing that all of the mixing, mastering and artwork creation can be sorted out via an internet connection – the files have been back and forth from Glasgow to London, Cardiff, Finland and even Thailand – but it’s nice to finally be yanking it out of cyberspace and turning it into something real. I’m really pleased with the album. I’ll keep the title a secret for a bit longer. It has a different sound to previous stuff we’ve done. It’s a studio album, recorded semi-live and it has a robustness and energy to it that I think feels quite fresh. I’ve got really good memories of the recording process and I think the songs have been captured in a way that sounds like a bunch of friends having fun together. Which is nice. We’ll save anguish, trauma and violence for the next record. We’ve got some end of year gigs coming up. First is Girl Effect #2 at Mono this Thursday (November 26th). I will be playing a couple of solo cover versions of girl group songs. The event is a fundraiser for Scottish Women’s Aid and the lineup is cracking. Then we have headline gigs in Glasgow and Edinburgh. We’re at the Hug & Pint on Saturday 28th November and the Summerhall on Friday 4th December. Support for Glasgow is Urvanonic and Edinburgh is Martha Ffion. Both are excellent. Finally, we’re doing an acoustic set on December 18th for the Flourish House Christmas Meal Fundraiser. It’s at the Hug & Pint again with performances from Finn LeMarinel and Carbs (who you may remember from ICDDTM#2) plus DJing from members of Franz Ferdinand and Happy Meals. Flourish House is a charity that enables people with mental health difficulties to gain a sense of well-being and the money raised from this show will pay for members to have Christmas dinner together. So please come along to that and help support the cause. No excuses. Hope everyone managed to enjoy Record Store Day or at least some of the blazing sunshine that we had in Glasgow and Edinburgh. I had a nice tour of some record shops, playing four short gigs to promote our new live album ‘Most Clunky’. I’m really pleased with it. It was recorded at Kid Canaveral’s Xmas Baubles at Portobello Town Hall at the end of last year. I think it captures us at a good time. It was the last of many gigs in 2014 and I think we sound like a really solid band. We’d just recently finished a two-week recording session for the next studio album so it was a nice celebratory gig. The set consists mainly of Clumsy Knot songs which have had time to evolve a bit and develop their own live identity. Songs like Light of the Moon, Microcosm and Foolishness of Youth sound pretty different to the album versions. I like that. You can preview Foolishness of Youth and Unnatural below. Most Clunky is available on multi-coloured 12” vinyl complete with digital download code. It looks pretty lovely. You can buy it from our online shop right here. We’ll also sell them at gigs. We’ve got a couple of great-looking shows coming up. We’re at the Newcastle Mining Institute on April 25th with The Artisans and Slow Decades and then Edinburgh Summerhall on May 7th with The Son(s) and Book Group. We did a live session for Marc Riley on BBC 6 Music last week. We played Foolishness of Youth, I Can’t Dance To This Music Anymore and Microcosm and I reckon it sounds awright. It was nice having the novelty of an upright piano. You can listen back on iPlayer for the next 26 days. By which I mean it’s available for the next 26 days. I’m not advocating 26 days of repeat listening. Catch you soon I hope. Hello. How are things? Adam here. We’re really pleased to be heading back to Manchester on April 16th for our third Marc Riley session on BBC 6Music. The programme starts at 7pm and we’ll be playing three songs. It’s a great show. We’ve got some stuff happening for Record Store Day on April 18th. We’re releasing a live album called ‘Most Clunky’ on vinyl. Recorded at Kid Canaveral’s Xmas Baubles at Portobello Hall last December and consisting of 9 songs mostly taken from Clumsy Knot (hence the anagram title), it sounds better than any of us can remember playing so really looking forward to letting you hear it. I will be playing some solo in-store performances on Saturday 18th at Love Music in Glasgow as well as Underground Sol’shn and VoxBox in Edinburgh. We’ll post specifics nearer the time. Thanks to everyone who came to I Can’t Dance To This Music #3. We had an amazing time. I was at the venue for 16 hours* but enjoyed every minute. The bands and comedians were all as terrific and funny and punctual and well-dressed and sweet-smelling as we could have hoped for and we managed to sell out the CCA which took us by surprise. There are nice reviews from Rave Child and Manic Pop Thrills and some great photos which I’ll post at the end of this blog. We released Isle of Love, our final single from Clumsy Knot, and it’s available on our website as a teatowel + postcard bundle which includes a download code for a series of remixes. There are only a few left. The I Can’t Dance To This Music t-shirts are back in stock too. Lastly, we have a bunch of new gigs lined up. The next big Scottish full-band show is in Edinburgh on May 7th. It’s in the amazing Summerhall Dissection Room as part of the Nothing Ever Happens Here series. We’re big fans of the other bands on the bill, The Son(s) and Book Group, so I reckon it’s going to be a real belter. Adam wrote a guest blog for Gold Flake Paint this week. It talks about the ICDTTM gig as well as our single release for Isle of Love + remixes. There’s a little video which was shot in Shetland and previews some of the remixes. Have a look at it here. Here are the running times for Saturday. Hope to see you there. Following the announcement of Tigercats, the musical lineup is now complete for I Can’t Dance To This Music on March 21st at Glasgow’s CCA. Tigercats are a fantastic, feel-good band from London. They’ve just released a new album called ‘Mysteries’ on Fortuna Pop. We’re absolutely delighted to have them on board. There is one more comedian who we’ll announce nearer the time. Tickets are still £12 but this will only last until the end of the month. From March 1st they’ll go up to £15. For 8 bands and 4 comedians, we still think that’s a bargain. Get tickets here. In other news, we’re steadily putting plans together for the year. There are a bunch of gigs in the pipeline, including newly announced shows in Edinburgh and Newcastle (see below). We’re also finalising a live mini-album and putting the finishing touches to our brand new, full-band studio record. We’ve booked some stand-up comedians for I Can’t Dance To This Music #3 at the CCA on March 21st! Those of you who were at ICDTTM #2 will remember Andrew Learmonth’s hilarious SHAMtastic set. He’s joining us again and this time he’s bringing fellow comedians Richie Brown and Paul McDaniel. We’re in for a treat. We’ve got a fourth comedian lined up who we can’t announce yet but we’re very thrilled about. And we still have EVEN MORE stuff to announce. Get your tickets here before the price goes up! We’ve got a poster and some new announcements for I Can’t Dance To This Music #3 to share. We’ve added three new bands to the bill. Already on the bill are Withered Hand (solo), eagleowl and us, your hosts, Randolph’s Leap. It’s happening on Saturday March 21st at the CCA, Glasgow.Tickets for this all-day gig are available for £12. They’ll go up to £15 as time goes on so we recommend getting them now. Gonna be great. Hope to see you there. 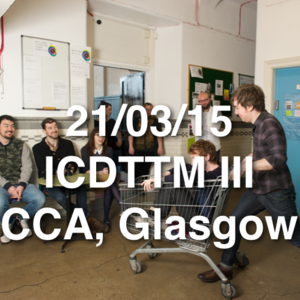 We are delighted to announce the first acts for I Can’t Dance To This Music #3 at the CCA, Glasgow on March 21st. They are WITHERED HAND and EAGLEOWL Yeeeha! We’re big fans and label-buddies of eagleowl and we’re super-chuffed to have Withered Hand on board. He was recently awarded The Herald’s Scottish Album of the Year and will be playing a solo set for us. Early-bird tickets have sold out but a batch of £12 tickets are available via Lost Map. Also, the Weatherman single is officially out this week. Here’s a link to the video, starring THE Michael Fish. You can download the song and the full album from iTunes or you can get a CD/vinyl copy of Clumsy Knot from our website.